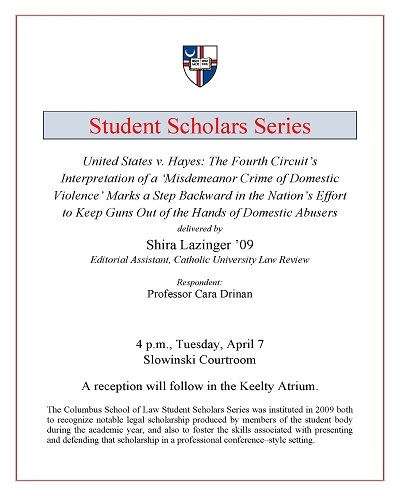 Lazinger offered her arguments and research on April 7 in a discussion titled "United States v. Hayes: The Fourth Circuit's Interpretation of a 'Misdemeanor Crime of Domestic Violence' Marks a Step Backward in the Nation's Effort to Keep Guns Out of Hands of Domestic Abusers. "The lengthy title bespoke a complicated legal issue, one that hinged on exacting scrutiny of the wording and even the punctuation of the written law. Various circuit courts have interpreted that law differently, and the issue was very recently settled by the United States Supreme Court. Lazinger, Shira, "United States v. Hayes: The Fourth Circuit's Interpretation of a 'Misdemeanor Crime of Domestic Violence" (2009). Student Scholar Series. 3.